This smoked fish recipe is for a very tasty version of smoked haddock florentine. 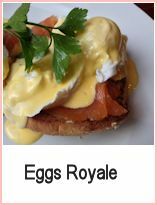 It's quite straight forward to make - how you poach the eggs is up to you, but I use a deep frying pan and add a splash of vinegar to the poaching water. 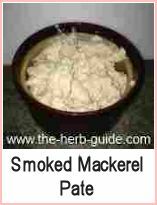 Put the smoked fish into a shallow frying pan. Cover with cold water and add a bayleaf if you like. Bring to the boil, then simmer for around 7 minutes until the fish is cooked through. Turn off the heat and leave the fish in the poaching liquid to keep warm. Rinse the spinach and mix in the leek. Put it into a large pan and place over a medium heat - the water from the spinach will steam the leeks as well - takes about 5 minutes or so. Give the pan a shake from time to time and maybe add a tablespoon of water if it looks like it's drying out. Half fill a frying pan with water and bring it to the boil. Add a splash of vinegar. Break in the eggs and allow to poach for around 3 minutes until the eggs are set. Pop them into cold water to stop them cooking. Then you can assemble the dish. I like to use small individual dishes for this, but you could use one large dish if you prefer. Put a bed of spinach and leeks onto the dish. Pat the eggs dry with some kitchen roll. 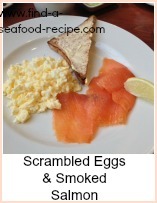 Add the fish then top with the egg and sprinkle grated cheese over. Pop under a grill for a minute or so to melt the cheese. Grind some black pepper and serve immediately. You could use frozen spinach in the smoked fish recipe if you prefer. Fresh is expensive out of season. 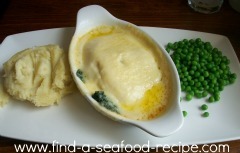 Some mashed potato and peas are great with Smoked Haddock Florentine. 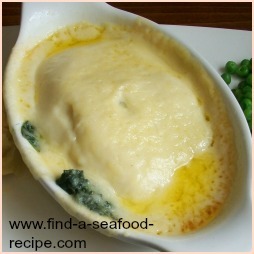 A version of Smoked Haddock Florentine - gorgeous mixture of fish, cheese, spinach and eggs.